While I was waiting patiently for my induction to start (which basically took like 12 hours), I was able to finish reading the latest Lady Julia book! And what a perfect read to pass the time! I’ve been a fan of Raybourn for quite some time, but the first Lady Julia book didn’t quite meet my expectations, however I liked her enough and love Raybourn’s ability to create romantic tension between characters that I thought I would give the second book a try. Having been away in Italy with her brothers and their friends, Lady Julia has heard nothing from her sort of love interest Nicholas Brisbane. But she has had word from her father who demands that she and her brothers return from Italy and come home to his estate for Christmas. Much to her surprise, the one man she had hoped to forget, is among her father’s houseguests…and he is not alone…..Brisbane is there with his finance! Not to be outdone, Lady Julia shows him that two can play at flirtation and promptly introduces him to her devoted, younger, titled Italian count. But the homecoming celebrations quickly take a ghastly turn when one of the guests is found brutally murdered in the chapel. Lady Julia resumes her unlikely and deliciously intriguing partnership with Brisbane, setting out to unravel a tangle of deceit before the killer can strike again. This book had much more chemistry for me than the first book! I was so relieved. I felt like there was such a focus on getting to know Lady Julia in the first book and there wasn’t enough romantic tension between the two to really intrigue me that much. However as I said before, Raybourn typically does a magnificent job at developing tension…..so I was willing to give the next book a try. I felt like the audience got to know Brisbane much more and it was clear that he is fighting his feelings for Lady Julia. I also liked how Lady Julia’s character is evolving and changing from the first book. She is becoming her own woman and isn’t just going to sit around and wait for Brisbane to make up his mind who he loves. In the first book she’s still trying to find out who she is, and in this one I think it’s pretty clear that she knows who she is and what she wants. The progression of their relationship is intriguing. I like that even in this book there are still unresolved feelings and the romance isn’t “resolved” meaning they haven’t fully acknowledged their relationship or feelings yet which means future books will continue to build the romantic tension which I love so much in Raybourn’s books! The mystery in this book was also interesting. I liked how it unraveled and how there were gothic elements in the story, even more so than in the first book. 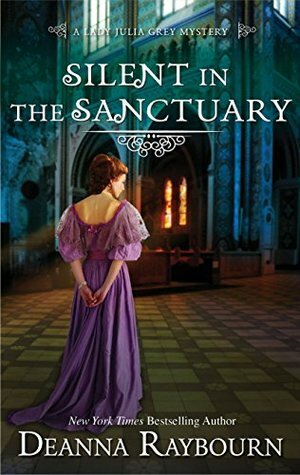 This book sort of had a Northanger Abbey feel to it which I thought was fun….the ghosts, the abbey like estate….I loved it. Very well done for setting and ambiance. While the mystery wasn’t overly complicated, there were enough little twists and different motives of each character to keep the reader guessing. All of Raybourn’s characters are very unique and memorable which I like and because of that, she has a great way of creating suspicion on any number of characters within the story so I really enjoyed that about this novel more so than the first. I will definitely keep up with this series now that I feel as though things are picking up and evolving. I am really looking forward to the next book in this series as it sounds like something right up my alley!